We had the opportunity to review Phonetic Zoo Spelling Level A [Starter Set] from the Institute for Excellence in Writing. This was my first time reviewing a product from this company, but I have been hearing such great things about them. I was thrilled that Tabitha was old enough to try out this spelling program. There was a Spelling Placement Test that she had to take, and she was right on the borderline of being ready for this program. She showed interest in it, so I decided to give it a shot. I have to say, I am very glad I did. The CD's we received are only for Level A. One of the great things about this program is, once you purchase the starter set, you don't have to purchase the full set of the next level to move on. All you have to do is buy the next set of CD's. You will also require a CD player, computer, or something to play the CDs or MP3 files. It is highly recommended that the child use headphones during their lesson time to minimize distractions and get the words close to the ear and brain. The final necessary supplies are a pen and paper. Yes, that does say pen, not pencil. There is a reason for this, and you can read about it in this article that I found highly thought provoking. The large lesson cards include the lists of words for all three levels. On the front of each card you will find 2-3 pictures of animals that help to demonstrate the spelling rule/jingle. There are also 3 sample words for each level. On the back of the card you will find the rule/jingle/hint in a box on the left hand side. This gives the child a mnemonic device to help them remember the rule. Next to the box there are three columns with the lists of spelling words. These cards have a hole punched in the left hand corner in case you wish to put them on a ring. I decided to store them in the plastic bag they came with, so I haven't been too concerned about using a ring. These smaller, playing card sized cards are the ones that a child gets to keep and display. On the front of the card is listed the lesson number, the spelling rule that is being focused on during the lesson, and the pictures of the animals that demonstrate the rule. The back of the card has the rule/hint/jingle written out again. It is recommended to give each card to the child at the start of the lesson. I, however, have been giving Tabitha hers at the end of the lesson as sort of a reward. Every fifth lesson is a Personal Spelling Lesson where the child will focus on words that you as the parent choose from misspelled words in writing assignments. The large card has lines on which you can write the spelling words. Each disc contains 18 or 19 tracks, for a total of 47 lessons and the final exams. Along with an introduction, disc 1 contains 8 lessons plus the 2 personal spelling lessons. Each of the lessons are divided into two tracks. The first track is the "test" which the child repeats until achieving a 100% twice in a row. The second track for the lesson contains the corrections that the child is to listen to in order to check their work. Discs 2-4 each contain 8 lessons along with the correction tracks for each, and the two personal spelling lessons. The final disc, disc 5, contains 6 lessons and 6 correction tracks plus 1 personal spelling lesson, and 6 tracks that focus on the final exam. 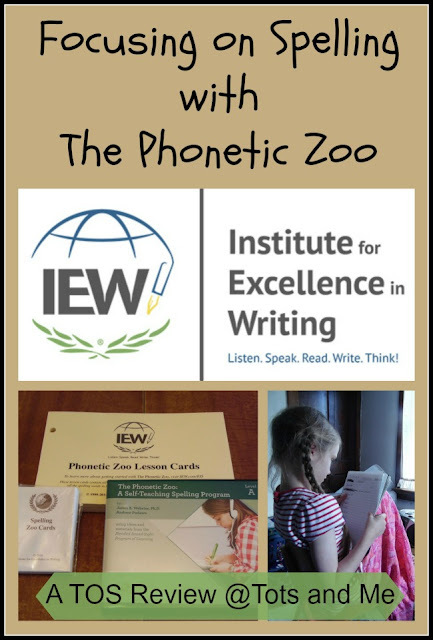 How does The Phonetic Zoo teach spelling? A Brief History of the Blended Sound-Sight Program. 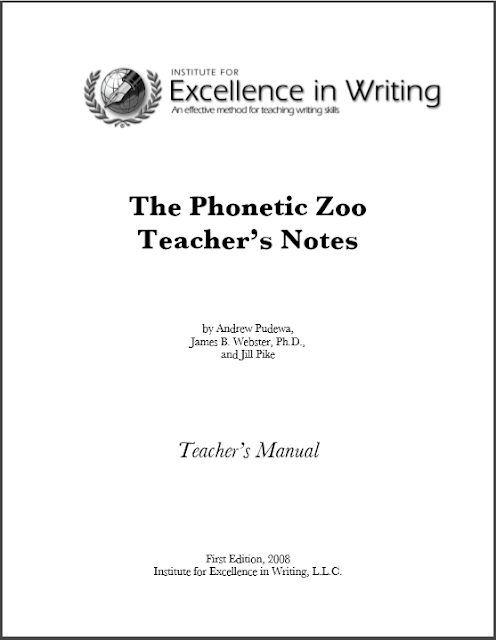 In this section you will also discover how it got the name "The Phonetic Zoo." How did we use Phonetic Zoo? When we first started I pulled out the lesson card for lesson 1 and went over the words and jingle with Tabitha. She then took it upstairs to her bedroom so she could have privacy. For each lesson she listens to the lesson track. The teacher says the word, uses it in a sentence and then pauses briefly for the child to write the word on her paper. If necessary, Tabitha does have permission to pause the CD so she can finish writing the word. Once all of the words have been written Tabitha is to move on to the correction track. The words will then be listed one at a time. The teacher on the CD reads the word, spells it, and again says the word. If any word is wrong, the correct spelling is written down by Tabitha. This actually is a wonderful program for a child to work independently most of the time. I did discover, after we were into the program a bit, that I could spend more time with Tabitha on the spelling list before she goes off on her own to take the test. So, yes, a child can work independently; however, they really do still need to be taught and have supervision. I was giving Tabitha the zoo cards to tape onto a piece of card stock as we didn't have any poster board to make the zoo. We recently purchased some poster board and I am in the process of creating the zoo as illustrated in the back of the Teacher's Manual. The reason for organizing them this way is addressed in the Spelling and the Brain seminar. One of the things that helps with spelling is categorizing the words. It is very important to watch the Spelling and the Brain seminar because he really does a wonderful job explaining how spelling should be taught to help it be most effective. As he says, "Spelling is the correct retrieval of sequentially stored, virtually random bits of information." He really does a wonderful job explaining the importance of frequency, intensity, and duration in spelling. We are enjoying using The Phonetic Zoo and I am quite impressed by Tabitha's recall of how to spell the words. We had gotten to the 5th lesson, which is a personal spelling lesson, and before I tested her on her trouble words, I had her spell all of the words from the previous 4 lessons. Though there was a bit of stumbling, which she was able to correct herself, she was able to spell all her words out loud to me, even the ones she struggled so much with in lesson 2. I do add a little bit to her lessons. I realize that worksheets are not beneficial, but to me just going down the list and taking the test repeatedly can get boring for the child, especially when it is a lesson that is tricky and is taking 10-11 times to get that 100% two times in a row. I have had Tabitha use the words in sentences or alphabetize them. Though this isn't a part of the program, I feel it is important for her to be able to use the words in context. I also think the occasional alphabetizing exercise is beneficial as she is also spelling the words an additional time. I would definitely recommend The Phonetic Zoo from the Institute for Excellence in Writing. It is a great program for children to learn to spell. I love the emphasis on the auditory process as it just makes so much sense. The child is focusing on one list of words until that list is mastered. This is so unlike school where a list is studied during the week and a test is taken, after which the whole class moves on, whether they are ready to or not. 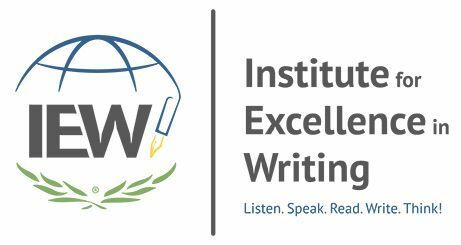 You can find The Institute for Excellence in Writing on Facebook, Twitter, Pinterest, YouTube, Vimeo, Google+, and Instagram. My fellow Crew Mates have been reviewing various products from IEW. Besides Level A of Phonetic Zoo, some were offered Level B and other received Level C. Still other reviewed the Resource Set which includes: Timeline of Classics, Teaching With Games Set, and A Word Write Now. You can check out the other reviews by clicking the banner below.